Easy vegan banana bread is the best banana bread out there! 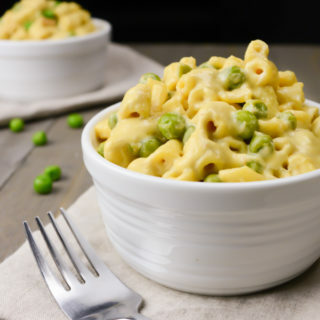 Just a few on-hand ingredients will bring this classic recipe together! For a nut-free loaf, replace the walnuts with one of the many add-in options below! 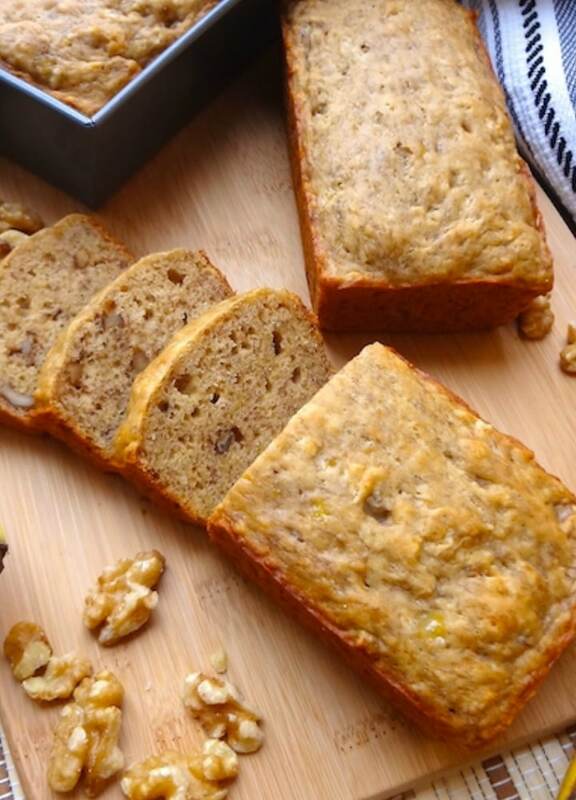 This super moist quick-bread will easily be your favorite go-to banana bread! If you have overripe bananas laying around use them up in this moist and delicious, quick bread. It’s so easy! It takes only 9 simple ingredients (no flax-eggs) and less than 15 minutes to bring together. This flexible recipe can easily adjust to being–oil-free, sugar-free, nut-free and even gluten-free! I’ve included substitutes for each one in the notes. Plus, there’s plenty of reassurance, advice, and success in the comments below making this truly THE BEST vegan banana bread! Is vegan banana bread easy to make? YES! 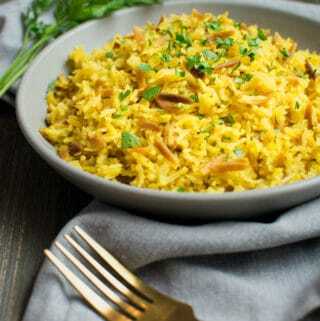 This quick and easy recipe is a cinch to bring together! Add the sugar and oil to the bananas. 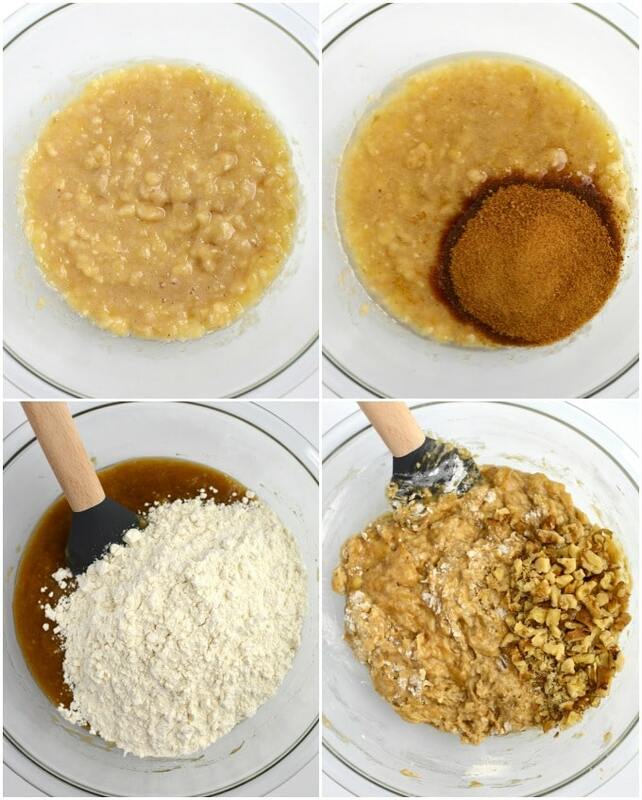 Fold the dry ingredients into the mashed banana mix. Fold in the walnuts or any other add-in option. Pour the batter into the loaf pan(s) and bake! 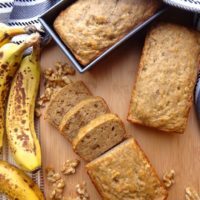 How do I make oil-free vegan banana bread? Simply replace the oil with an equal amount of extra mashed banana or applesauce. That’s it! How do I make it gluten-free? Simply replace the all-purpose flour with any gluten-free flour blend at a 1:1 ratio. Can I make banana muffins? Absolutely! Muffins are great for a grab-n-go breakfast. Evenly divide the batter between 12 muffin liners. Bake at 350ºF for 20-25 minutes or until a toothpick/tester comes out clean. 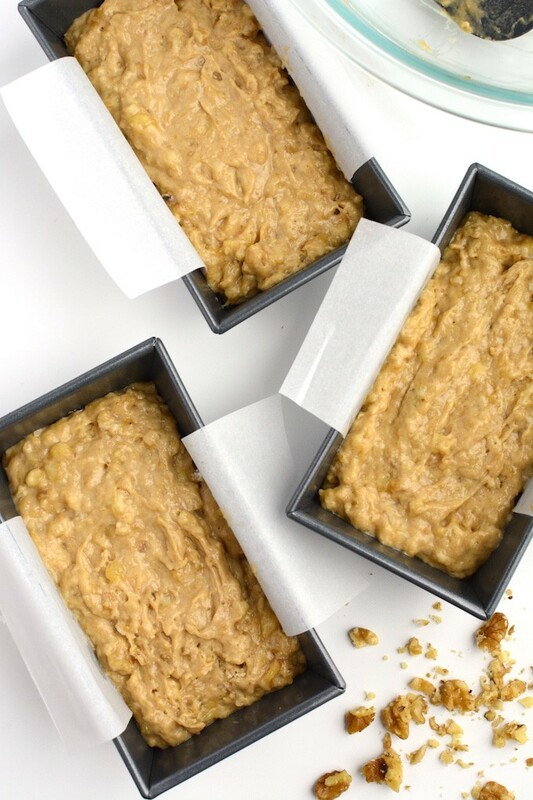 How do I freeze vegan banana bread? To freeze: Allow the bread to cool completely. Wrap the cooled loaf in plastic wrap then a layer of foil. Place wrapped bread in a freezer bag and freeze for up to 2 months. Thaw the loaf unwrapped on the counter for 3-4 hours before enjoying. Or reheat the frozen loaf in the oven at 350ºF for 30-40 minutes or until heated throughout. This moist bread is best with overripe bananas that have lots of brown spots. They will yield a perfectly sweet bread with tons of banana flavor. For bananas with less brown spots, taste test them. If they aren’t very sweet increase the sugar 1-2 Tablespoons. If they lack in the banana flavor throw them in the trash. Ha! I’m just kidding, they will still produce a delicious moist loaf with just a bit less banana taste. You can always add in extra nutmeg or a few teaspoons of cinnamon for more flavor. Feel free to mix-up the additions. I love adding chocolate chips and dried cranberries! But if you’re looking for a classic banana bread, it’s also delicious plain. So don’t let those ripe banana’s go to waste! If you loved this recipe, please leave a 5-star rating in the recipe card and share your thoughts in the comments below. Also, if you snap a photo be sure to share it with us! We love to see your creations! You can find us on Pinterest, Instagram, and Facebook. 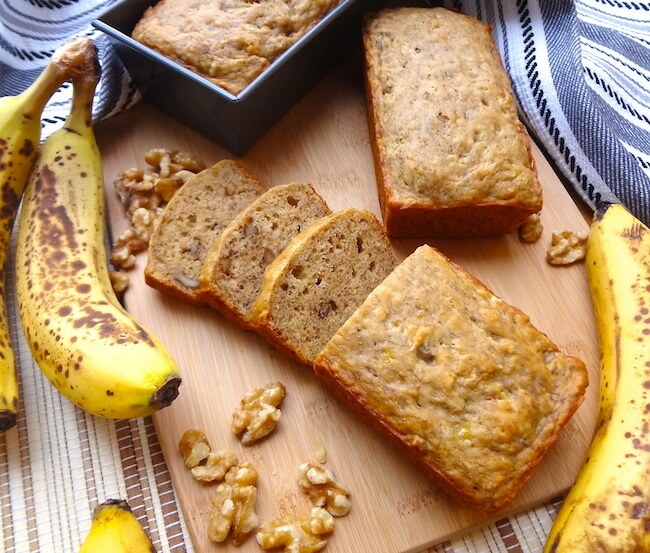 A few on-hand ingredients will bring this easy vegan banana bread together in no time! 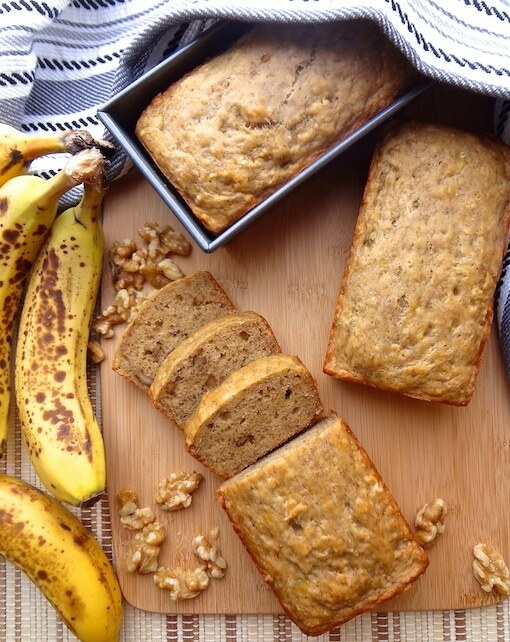 This super moist, egg and dairy free recipe will be your go-to banana bread! So don't let those ripe bananas go to waste! Start by preheating the oven to 350ºF, oiling the loaf pan/pans (or line with parchment paper) and chop the walnuts. In a medium bowl, sift together your flour, baking powder, baking soda, nutmeg and salt and set aside. In a separate bowl, mash the bananas. Make sure not to leave any big chunks. Small chunks are fine though. Now, gently fold in your walnut pieces or other add-ins. Pour the batter into the prepared loaf pan/s. Bake at 350ºF for 30-40 minutes for mini loaves or 50-60 minutes for 8x4-inch regular loaf. Test the bread with a toothpick for doneness. It will come out clean when the bread is ready. If the bread is still too moist bake at 5 minute intervals until done. I suggest weighing the bananas for best results. When measuring the flour, use a spoon to scoop it into the measuring cup. Scooping the flour with the measuring cup can cause too much flour to be added. Gluten-Free: The all-purpose flour can be replaced with a 1:1 ratio of a gluten-free flour blend, spelt flour or whole wheat flour. Sugar Substitutes: Coconut sugar can be replaced with brown sugar or any granulated vegan sugar. For a sugar-free option omit the sugar and use extra sweet/ripe bananas. Coconut oil Substitutes: Replace with any neutral baking oil. For oil-free option use an equal amount of applesauce or extra mashed banana. Nut-free: Simply omit the nuts or replace with any nut-free option listed above. 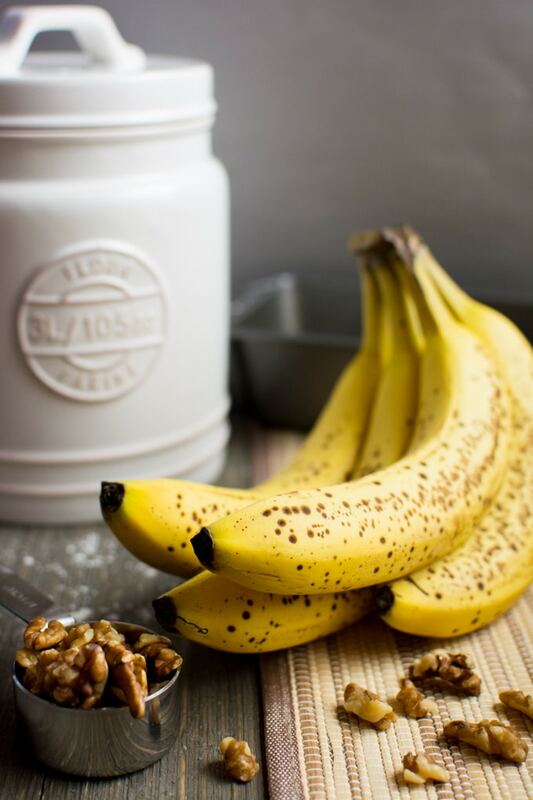 If your bananas seem dry after mashing add a 1/4 cup of non-dairy milk to them after mashing. Store the bread in an airtight container or bag. It will keep fresh on the counter for up to 3 days, or a week in the fridge. Mini loaves make a great homemade gift. Bake the batter in paper mini loaf pans. Slip the baked bread into a cellophane treat bag. Finish it off with a festive ribbon and gift tag. You can also use the above method to freeze mini loaves. Simply bake the bread in 3 mini loaf pans. Enjoy one now and freeze the other 2 for later. Easy to make, tastes amazing... And I don't like banana bread. Make it today. 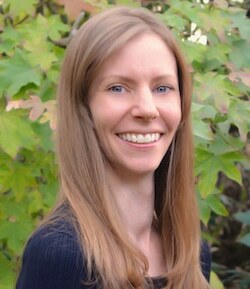 Thank you for the great feedback, Laura! Thank you so much. This is of great help. My new man is vegan and loves Pushkins bakery banana bread, but I made this for him and might have snagged a husband lol. He raves about it and begs me for more. I have to oven ripen the bananas because I can’t wait around for them to ripen and make it fast enough. Keep the recipes coming! I love this so much! I made it today it it is delicious! However, when I baked it, it had cracked all the way down the middle, if that makes sense, so it didn’t come out looking like your beautiful loafs in the picture. Do you know any helpful tips for what I can do next time to make sure it doesn’t crack? Delicious! 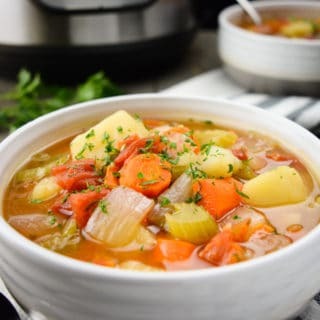 This is a fabulous vegan recipe! Best vegan banana bread I’ve made! Can i use Bob's GF fluorine place of AP flour? I've made this recipe twice now and it's so good! It's my go-to banana nut bread recipe! I substituted the coconut sugar with date sugar and added in bit of chocolate chips. It's such a huge hit with my husband and my twin toddlers. Love this recipe! I omit the sugar and add vegan chocolate chips and it turns out great! Thanks so much for the yummy recipe! That's awesome Daria! I love adding chocolate chips! Cant wait to try.. Can we use honey instead of suger? I made this recipe today. It’s super easy and came out amazing! I used spelt flour instead of regular, and added a few mini chocolate chips. So good! I will definitely make it again. This is my new go-to recipe for banana bread. I made it a few times and it turned out really well. I'm making it now again and I can't wait for it to be ready. This is the best banana bread recipe ever. I’ve tried vegan banana bread before, this is wayyyy better. It’s not overly sweet and it’s moist. My family loves it. But sadly I only make this bread just for the hubby and kiddo now since I started my KetoDiet. Can I substitute the AP flour with almond flour or coconut flour? Can I also substitute the sugar for erythritol? OMG THIS IS SO GOOD!! I made this as my breakfast meal prep for this week (Just posted a short review on my Fitness/Health Instagram- @macygetsfit !). I added just a touch of almond milk to the dough and chocolate chips to the top, and it's so good! I wanna make this again and again. Thanks for the great recipe! Thank you so much for the kind words Macy! I just visited your post on IG, I'm so glad you enjoyed the bread! I can never seem to keep it in the house long enough for meal prep. It's always devoured in a about day! I am so excited to try this recipe!!! I was wondering if you could substitute maple syrup for the coconut sugar. If you have tried this, please let me know. Thanks for the recipe! !